It’s time to redefine what it means to teach. Students already learn much differently than they did a decade ago, but educators have been slow to adapt, causing a rift between instructor and pupil that manifests itself in sliding test scores, retention rates, and educational quality in general. With the advent of more sophisticated learning analytics and assistive technologies, we’ll begin to move forward, but we need to make some fundamental changes in the way we practise our craft right now. In fact, that’s the keyword: “practise.” It’s time to stop theorising and start acting, because students aren’t going to wait around for the next big shift in pedagogy. Modern society needs teachers who can adapt, quickly and effectively, to the demands of the moment. And that all starts with an awareness of the change happening around us. While most educators have rejected the notion of the sage-on-the-stage for some time now, Brack and Cowley raise an important point: If students can learn everything there is to know about a subject from a Wikipedia page, where does our authority come from? What exactly do we have to offer aside from expertise? Mark Bauerlein, an English professor at Emory College, laments the time when students went to their instructors for mentorship. Citing his own experience at UCLA in the 1980s, he recalls a time “when you couldn’t walk down the row of faculty offices without stepping over the outstretched legs of English majors lining up for consultations.” Students wanted to have conversations outside of course time. They wanted to engage. But all that has changed. What are teachers to do with these shifting student priorities? One option, Brack and Cowley write, is to embrace the performance aspect of instruction. Whether or not you’ve got a theatrical side, the point is this: The information itself no longer matters as much as the way it is presented. Sure, students can read everything there is to know about World War I on Wikipedia, but is that the most enjoyable or thought-provoking way to learn the material? No, and that’s where we must force ourselves to evolve. Doing so is not only good for student learning, but also for our own development as teachers. Educator, consultant, and author Doug Lemov spends a lot of his time focusing on performance. And not just his students’ performance–his own. Lemov created a taxonomy over the years, illustrating how to perform effectively as a teacher, and in 2010 he was asked to develop it into a book. Teach Like a Champion, which lists “62 techniques that put students on the path to college,” became a best-seller, and features specific, actionable strategies that increase student engagement. The reason he focuses on practice, and not theory, is because he views teaching as a process of self-improvement. While many of us might think you’re either born a “good” teacher or a “bad” teacher, either possessing that magical knack or not, Lemov believes we can all become good teachers– and we must. At Lemov’s workshops, teachers rehearse asking questions and taking answers– not something you would think takes much practise. But Lemov cites research suggesting that the average time a teacher leaves between question and answer is 1.5 seconds. That is not enough, he says. Imagine you pose the following question to your students: “What was the immediate cause of the first world war?” Three hands go up immediately. You decide which one to pick. That student gives the answer you taught last week: the assassination of Archduke Franz Ferdinand. But what about the student in the third row who was on her way to getting the answer right but gave up as soon as you called on someone else? What if there is another student, in the back row, who does not even bother thinking any more because he knows someone else will always gets there first? Several institutions use Lemov’s book, which is full of points like these, for everyday instructional guidance. Dixons Trinity in Bradford, England, is one of them. Its principal, Luke Sparkes, says there is “no single innovation or magical personality around which everything revolves, just a shared and relentless attention to better execution.” The teachers have a genuine interest in improving, and know that they won’t be able to without continual practice and reflection. “You need a self-critical disposition to work here,” said one teacher, Jenny Thompson. And that’s exactly what makes the staff so effective. Performing doesn’t mean you have to affect anything; on the contrary, it pays to be transparent. Part of honing one’s performance is knowing how and when to take on the “facilitator” role, especially when it comes to edtech. And just because they didn’t cover it when you got your teaching certificate twenty years ago doesn’t mean you can opt out. A recent Finnish-Swiss-Belgian study found that using technology “changes the role of the teacher from a traditional knowledge provider into a facilitator guiding the students’ learning processes and engaging in joint problem-solving with the students.” Smartphones, for example, opened up new possibilities where students had a more active role than before. They could write scripts and make videos that illustrated the material being learned. The target group of the study consisted of first and second year vocational students and their teachers from different fields. The researchers focused on the interaction between the teacher and students in various technology-supported learning environments. Though it may seem obvious that technology can enhance learning, it’s often unclear exactly how involved teachers should be in the process. So where do we fit in? It’s a little like actors and directors working with a script– who decides how to interpret it? One sensible response is that we should only use technology if it actually improves learning. That is, not as a fancy supplement, and not because it’s “cool.” We may try to reach digital natives, as they’re called, through their own medium, but this is a mistake if the medium proves to be more interesting than the material. Determining which “blend” of tech and tradition to use in your course takes experience and time. And you may not find an all-purpose formula. The most important part of being a facilitator is to allow change to happen, so it’s okay if you’re always trying new things. 1. Give students something they can’t read. Don’t be a content expert; be a luminary. Be influential. Teach students how to think, laugh, share, fail, and succeed. Not a minute of course time should be spent asking students to read textbook passages or presenting information without insight. Think about the questions Google can’t answer and teach those. 2. Be a concept mentor, not a content mentor. 3. Invest in your own continual development. We could all benefit from being a little more adaptable. Instead of resisting outside change, expect it. Instead of leaning towards self-preservation, lean towards self-improvement. 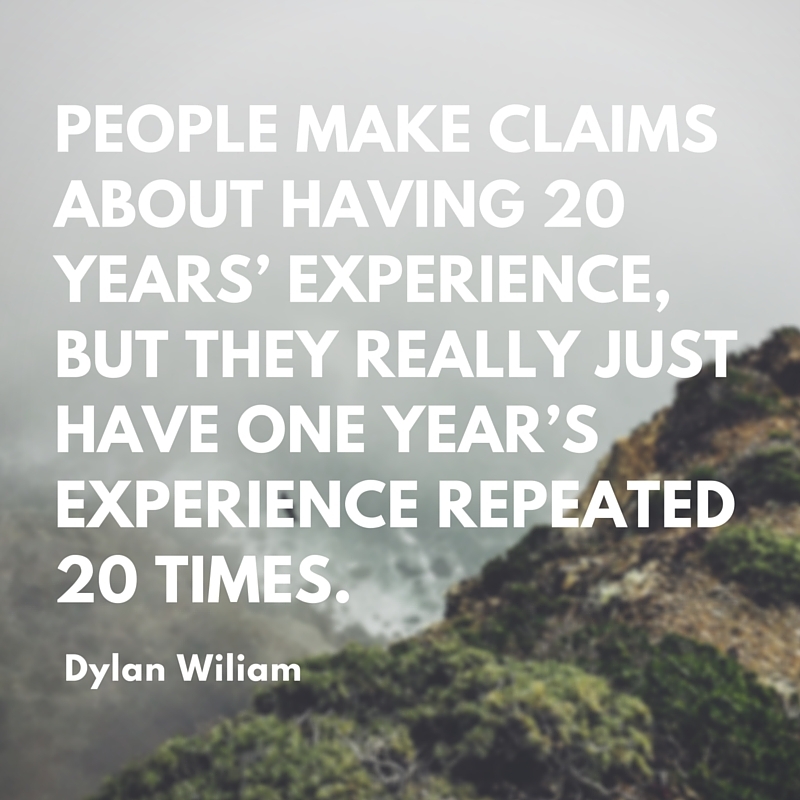 Don’t be the teacher who claims to have twenty years’ experience when you’ve only got one year’s experience repeated twenty times. Seek out your own professional renewal. 4. Tell students why and how you’re changing. Why does teaching strategy always have to be kept secret from the people it affects–students? As a modern-day society, we share more with one another than we ever have before. Why not discuss change and experimentation with your pupils so that they can feel like they’re a part of it? You don’t have to administer a survey every time you try a new technique; just keep your learners in the loop. 5. Use technology for the right reasons. It’s going to become harder and harder to separate product from practical use. Start voicing your opinion now about what works and what doesn’t, and whether more tech always translates to more learning. If you encounter a situation where you think the old method still works best, don’t be afraid to challenge people who suggest otherwise. Your article has made me reflect in my teaching practice, congratulations. I´m trying to seek out my own professional renewal every day. That´s my target all my longlife career. Thanks so much for sharing your findings in education, I appreciated too much all human being who lives for better human beings.